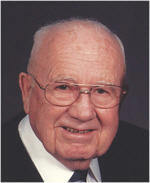 Chester “Chet” Schiewe, 88, of Pendleton died at St. Anthony Hospital on February 26, 2011. Chet was born on September 22, 1922 in Portland , Oregon to Paul T. and Bertie R. (Cummings) Schiewe. He graduated from Molalla High School in 1940. He attended the University of Oregon and graduated with a Bachelor of Science in Physical Education and a Master’s Degree in Education. He served his country as a member of the US Navy. Chet married Mary Miller in Needy, Oregon on October 22, 1944. They moved to Pendleton in 1949. Chet was a Coach, an Athletic Director and Assistant Principal at Pendleton High School. He was a life-long supporter of youth in the community. Chet is survived by his daughters, Karen Schiewe of Pendleton and Sandy Macomber of Pendleton; son, Roger Schiewe of Beaverton, Oregon; brothers; Dallas Schiewe of Lemoore, California and Elmo Schiewe of Bend, Oregon; and a sister Ethelyn Morgan of Beaverton, Oregon; 5 grandchildren and 12 great-grandchildren. He was preceded in death by his parents and his wife Mary. Memorial contributions may be made to the First United Methodist Church, or a charity of your choice, c/o Pendleton Pioneer Chapel, Folsom-Bishop, 131 SE Byers Ave., Pendleton, Oregon 97801.